Jenni O’Neill, mother of two from Gloucester in NSW, shot off a missive to the Department of Education last week. 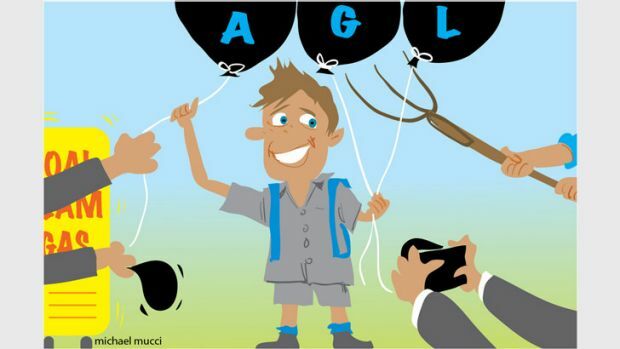 O’Neill and others are unhappy that operatives from AGL – which is drilling for coal seam gas in the area – had been handing out balloons to children from Barrington school during an excursion to the local show. AGL had also taken photos of children from Stroud school next to an air-conditioner, which it had donated to the school, which was featured in an ad in the local rag. There was no consent from Barrington school parents and the action constituted a breach of department policy on commercial arrangements. The response from the department was lame. There was nothing from AGL. O’Neill had them down cold. On one view of it, handing out a few balloons is harmless enough, but AGL’s community initiative was seen by disgruntled locals as an insidious plot by a corporate giant to brainwash young children. AGL’s ploy is not so much about saving energy as rallying the community behind its plans to drill for coal seam gas. The O’Neill correspondence also laid out the perils of CSG mining: contamination of an aquifer by Santos in its Narrabri project, assorted breaches of environmental guidelines, and so on. AGL is on a hiding to nothing. Its chief executive Michael Fraser, who is due to retire by next year, should take the opportunity to cut and run from this CSG folly. This is a consumer business with 6 million customers. Its reputation is at risk. The science on fracking is out. AGL has no plan for disposing of the waste at Gloucester apart from spraying 37,500 tonnes of brine onto the Avon River floodplain, an el cheapo solution likely to destroy the river. Feelings are running high, especially since the government sided with protesters at the Bentley blockade last month and knocked back Metgasco’s plans to frack. Metgasco was chided for lack of community consultation. Now, AGL is under attack for overcooking its community consultation. This is the gas equivalent of the Arab Spring. The people are rising up. Little can stop them. The locals, farmers and greenies alike, simply don’t want CSG. It is too risky. Ironically, events at a global level also conspire to wreck the gas aspirations of AGL and its cohorts Santos and Origin. In a deal whose sheer size and ramifications are fearful to contemplate, Russia has signed a $US400 billion ($430 billion) deal to pipe gas to China at roughly half the price of Australia LNG shipments to Japan. The first stage of this project alone is equivalent to 11 per cent of global LNG supply. The second leg is another 9 per cent – all up 20 per cent of world supply, a potential price killer for Australia’s putative exporters. This deal was 15 years in the making. Why now? The catalysts were Ukraine for Russia and South China Sea security matters for China. It suddenly made sense. China has sided with Russia over dependency of US allies for energy and the geopolitical implications are immense – as is the significance for our east coast gas producers AGL, Santos and Origin. Rather than allowing for one large LNG terminal shared by all players via a policy of ”unitisation”, the Queensland government bizarrely espoused three. It is the rush to meet export demand that is driving up prices, not a shortage of gas. Meanwhile, industry is running a scare campaign that prices will run higher unless we develop coal seam gas. But what the companies are telling government and the market are different things. Take Santos. Analysts have scaled back their valuations on the group’s Gladstone LNG project by almost half. According to research by Credit Suisse, ”Santos now argues that its aim in Gladstone LNG was always as much about raising the domestic gas price, and therefore re-rating large parts of the portfolio outside of GLNG, as it was about the project”. In other words, its LNG project is turning sour, so now Santos is telling analysts it was deliberately trying to ratchet up the price of gas all along. Not only are consumers getting smashed but the entire economy is hostage. Thanks to these people piping their gas to Gladstone, prices are already up from $4 a gigajoule to $8.70 a gigajoule. Credit Suisse reckons that every $2 GJ rise in the gas price puts an 0.8 per cent drag on the economy. As for their fear campaign on jobs; buried in Santos’ own modelling is the estimate that the Narrabri coal seam gas project will only add 16 jobs in the north central plains region. AGL statement: “AGL recently donated an air conditioner to Stroud Road Public School to help cool their classrooms in the hot summer months. The air conditioner was accepted by the school and to show thanks students and teachers agreed to be in a photograph with an AGL employee. As per our AGL policy, signed consent forms to allow the photo to be published were received from the parents of each child. Helping out Stroud Road Public School is one of the many ways AGL develops meaningful relationships in the rural communities where we work. “Another way we do this is through our appearance and sponsorship at annual community shows. In April, AGL once again had a stall at the Gloucester Show and was invited to have a stall at the Stroud Show for the first time, where AGL staff ensured locals were given access to any information about our projects and to better understand what we do. Promotional material such as balloons and caps were handed out, as they are at all stalls at public shows, however this material was only given to school students with permission of the accompanying school teacher. PreviousIs petrol producer an empty Shell?